Spend your holidays in the snowy mountains of the Alpine and Bavarian regions without leaving the comfort of your home. Our Alpine Village Collection by Department 56 is perfect for embracing iconic old-world style for the holidays. 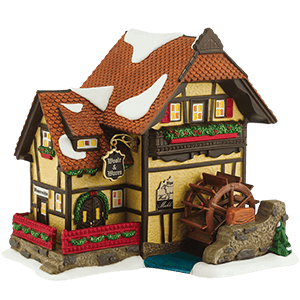 Shop here for both Alpine Village buildings and the figurines to go with them. From intricate little shops, ski lodges, and quaint chapels to nativity sets, our Alpine village buildings are exquisitely detailed, and many even light up. 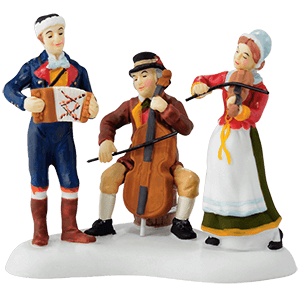 Alpine Village figurines range from dancing couples in Bavarian costumes, musicians playing traditional instruments in the snow, a gathering of nuns, and much more, all made of high quality porcelain and carefully painted by hand. Create your ideal Alpine Village with the matching pieces in this category, and enjoy the charm of deep-rooted European tradition this holiday season. Create your own beautiful Alpine Village display with a series of intricately detailed and illuminated buildings as unique and diverse as the towns and hamlets of the Alpine and Bavarian regions of Europe! Craftsmanship and imagination combine to create the charming array of winter festival booths, Bavarian shops, rustic homes, and a quaint chapel in this village set. Oktoberfest music, ski chalets, savory foods, and Neuschwanstein Castle are just a few of the things that may come to mind when gazing at these pieces! These hand-painted porcelain buildings feature snow-topped roofs, holiday wreaths, and bright colors that will add a festive air to any Christmas setting. Many of these pieces can be plugged into an electrical outlet to spread a cheery glow throughout your wintry scene. Your miniature Alpine town will stand out among your other holiday decorations with its lovely and unique style. Populate your Alpine village with the colorful characters that you can find here among these hand-painted porcelain figurines from Department 56! Inspired by the iconic old-world style of the Alpine and Bavarian regions of Europe, some of these collectible village figures wear traditional clothing like lederhosen and dirndls, while others have bundled up in brightly hued scarves and hats as they head out to the holiday festival. In addition to Alpine dancers, musicians, painters, and other characters, we carry scenic accessories for your village landscape like a Christmas tree figurine to place at the center of your miniature town. These Alpine village accessories make the perfect pieces to round out your holiday display.